What's better than a summer wedding? Well, a summer wedding outdoors at a rustic barn, of course! A few weeks ago, we were fortunate enough to be part of all the fun for Jamie and Stephen's fun-filled wedding at Kitz Farm. And here's the best part.... their ceremony took place at the top of a hill overlooking a picturesque lake. The walkway up to their ceremony location was adorned with flowers and messages of love. Love those touches! 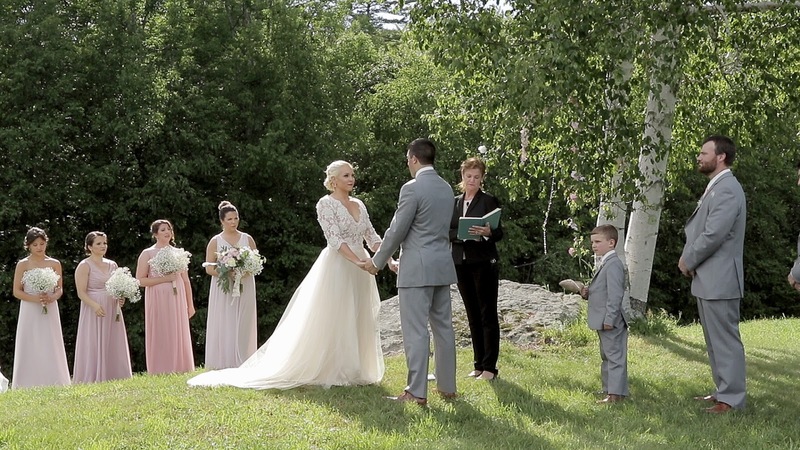 We're still going through countless hours of footage, but we're celebrating the completion of their wedding ceremony segment by sharing a three-minute clip highlighting their wedding vows and ring exchanges. Jamie and Stephen picked a stunning location for their ceremony, and I still cannot get over how the gentle afternoon breezes cause the tree-filtered sunlight to give a beautifully warm glow on the couple's faces. Their beaming smiles give clue to how excited they are to be starting a new chapter in their lives. More to come soon. Congrats to Jamie and Stephen!